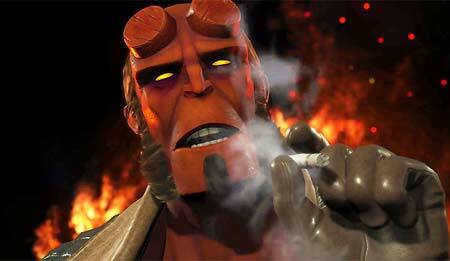 Hellboy is a playable DLC character who appears in Injustice 2. As a member of the Bureau for Paranormal Research and Defense, Hellboy has defended the world from fiends, witches, demons, and more than a few Lovecraftian Gods. With his trusty revolver and his Right Hand of Doom, Hellboy has made monster disposal his specialty. While fighting Hellboy uses his revolver as well as an assortment of specialist grenades and magical relics. If you get stuck in the game, check out the video walkthrough and gameplay for the game. This entry was posted in Android Games, iOS Games, Mobile Games, Walkthrough and tagged Injustice 2 Fighter Pack 3, Injustice 2 Hellboy Cheats, Injustice 2 Hellboy Gameplay, Injustice 2 Hellboy Guide, Injustice 2 Hellboy Hints, Injustice 2 Hellboy Review, Injustice 2 Hellboy Solutions, Injustice 2 Hellboy Strategy, Injustice 2 Hellboy Tips, Injustice 2 Hellboy Tutorial, Injustice 2 Hellboy Walkthrough, Injustice 2 Walkthrough by Marvin. Bookmark the permalink.